Just curious, but does anyone actually like her? XD Brat’s probably my least favorite of the cast. I think she’s clingy and annoying…but that’s me. I figured clingy and annoying was what you were going for, as a real person unlikable sure but has such comedic potential in the comic world. I’m just glad we don’t see her often :meh: also, how is she 17? she looks younger than me…. Yeah, she’s 17 if you read her bio page. At least Brat looks like herself. I can’t tell most of the other cast apart. I thought Ookaminokishi was off camping this weekend, they got internet in the woods? Ah, poor Wiglaf and Mordred……Always being stalked…. Not that one, Wiglaf. You look too much like Arthur with that black and red. Unless you’re trying to damage his morale by showing him up? Hurrah for the return of the girl-mob! Lol I love the last panel. mmm, jealous mordred? ^-^ yeah, i agree with NJ…Brat’d piss me off to no end in real life, but i like her in the comic. 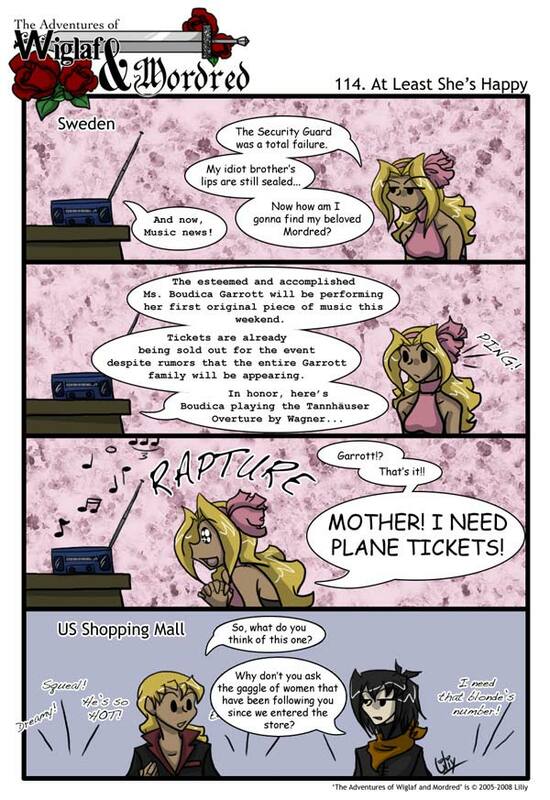 XD I’m not really a fan of Brat, but I don’t mind her, she’s useful to the comic. I totally just noticed that Wiglaf’s hair grows really fast….